Gail Crowther's recently published The Haunted Reader and Sylvia Plath (Stroud: Fonthill Media, 2017) is a book I hope many people buy and read. As I was a participant in the book, I do not feel comfortable reviewing it. I do, however, feel I can promote it. The Haunted Reader is about Sylvia Plath, but also about her readers. I think in the stories Gail collected and tells, that each one of us may find a similar thing happened when you first started reading Sylvia Plath. And the wonderful thing is, even with those similarities there are more than likely significant differences in how each of us came to Plath and how we all read and react to her work. When Gail's first book, Sylvia Plath in Devon: A Year's Turning came out I took a copy of the book all around Boston and Wellesley with me photographing it in various places and situations. I decided to do the same with her recent work, though scaled back just a bit. Here is Gail's book hanging out with some friends. The Haunted Reader and Sylvia Plath considered going into the Christian Science Church, but in the end the day was too nice not to be outside. However it was not nice enough outside to deny ourselves some refreshments -- a nice French Roast coffee, black and scalding just like Plath liked it, and a chocolate chip cookie -- at Oakleaf Cakes on Westland Avenue. In the process of wandering around Boston's Back Bay and Fenway area, I discovered that her publisher Fonthill had already embarked on a massive promotional campaign for the book, in advance of its scheduled availablity in the US on Amazon.com on 21 April 2017. Here is a big poster on a brick wall near the Berklee College of Music, which is home to the worst-dressed college students in the country. Thank goodness Plath is classing it up a bit with her awesomeness. Not to be outdone, the cover was screen-printed to cover twenty or so stories of the south-west facing side of the John Hancock Tower. All frivolity aside, Gail's book is a unique approach to Sylvia Plath and I hope you enjoy it. All links accessed 21 March 2017. The internet got an interesting story yesterday and today in "Unseen Sylvia Plath letters claim domestic abuse by Ted Hughes" authored by Danuta Kean of The Guardian which saw "Ted Hughes" trending on Twitter. Today, it's "#NationalGrilledCheeseDay". Ms Kean contacted me through a friend and we discussed the sudden presence of the Harriet Rosenstein Sylvia Plath archive which I blogged about on 10 March and its disappearance by 18 March. However, Ms Kean uncovered that the archive was removed because of a pending legal concern. Kean's article was instantly picked up by a number of other news sources, and some of the facts from it were even more quickly transformed into complete untruth. The following are articles, listed in no particular order, that I have found on it in varying degrees of veracity. If any new articles appear they will be listed below. Danuta Kean, "Unseen Sylvia Plath letters claim domestic abuse by Ted Hughes". The Guardian. Sarah Churchwell, "Sylvia Plath, a voice that can't be silenced" The Guardian. Roisin O'Connor, "Sylvia Plath letters set to be published this year claim domestic abuse by Ted Hughes". The Independent. "Sylvia Plath letters reveal abuse by Ted Hughes". The Irish Times. Anita Singh, "Sylvia Plath claimed Ted Hughes 'beat her up' two days before she lost her baby". The Telegraph. Adam Sherwin, "Sylvia Plath letters claim Ted Hughes ‘beat her days before miscarriage". iNews. James Tozer, "How pregnant Sylvia Plath was beaten by Ted Hughes two days before she miscarried their second child, her lost letters reveal". The Daily Mail. Maya Palit, "Newly Discovered Letters from Sylvia Plath Reveal Terrifying Things Ted Hughes Did To Her". The Ladies Finger. Anita Singh, "Ted Hughes' widow says Sylvia Plath claims of domestic violence are 'as absurd as they are shocking'". The Telegraph. "Sylvia Plath claims 'absurd', says Ted Hughes' widow". BBC. Ella Risbridger, "The letters Sylvia Plath wrote to her therapist are not ours to see". The Pool. Chris Elliot. "Claims that Ted Hughes beat up Sylvia Plath before she miscarried rejected by ex-Poet Laureate's estate". Cambridge News. Liam Taft, "New letters from Sylvia Plath reveal the extent of Ted Hughes’s abuse". The National Student. Claire Fallon, "Sylvia Plath Alleged Abuse By Ted Hughes In Unpublished Letters". The Huffington Post. Rafia Zakaria, "Sylvia Plath's letters probably won't harm Ted Hughes's reputation". The Guardian Blog. Eilis O'Hanlon, "A sputtering backlash may be fun, but it means nothing". The Irish Independent. Claire Nally, "Sylvia Plath: just because she wrote about her life doesn’t mean it’s public property". The Conversation. Unfortunately at this time I can just compile the stories as they appear. I am not in a position to be able to comment on them. All links accessed 11 and 12, 16 April 2017. Dr. Maeve O'Brien (aka theplathdiaries) has announced a Call For Papers for two-day symposium to celebrate the release of The Letters of Sylvia Plath, Volume 1 at The MAC and Ulster University Belfast, 10-11th November, 2017. The symposium title is Sylvia Plath: Letters, Words and Fragments and will be held at Ulster University, Belfast, Northern Ireland, from 10-11 November 2017. This is terrifically exciting. And that is an understatement. Papers from all disciplines are welcome - with full panels and artistic contributions especially encouraged. Please send proposals of no more than 350 words by Monday, 31 July 2017. Please visit the conference website. You can look for updates on Twitter or Facebook. Maeve can be contacted via email, too. All links accessed 5 April 2017. A rare book recently appeared for sale that is not for the faint of wallet. Offered by Blakeney Griffin Booksellers of London, this copy of the anthology Light Blue, Dark Blue (1960) comes from the Estate of Olwyn Hughes. Original blue cloth, titles to spine in navy blue. With the dust jacket. An excellent copy in the dust jacket. 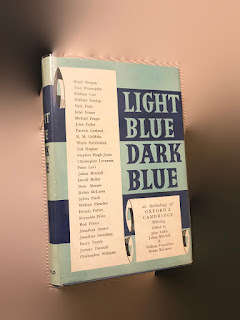 Light Blue, Dark Blue is "An Anthology of Recent Writing from Oxford and Cambridge Universities" and was edited by Julian Mitchell & John Fuller for Oxford and William Donaldson & Robin McLaren for Cambridge. "From the library of Ted Hughes and Sylvia Plath with Plath's inscription to the front free endpaper, 'Ted & Sylvia Hughes London 1960'." "A breath-taking copy of this notable anthology famously printing (besides a poem from Hughes's Hawk in the Rain) the first appearance of Plath's work in a regularly published book. Her privately issued publication A Winter Ship came out later in the year as did her landmark collection, The Colossus." "Books inscribed by Plath are deeply uncommon for diverse reasons: her early death of course and also for reasons of physical isolation. The form of the present inscription - her use of the adopted surname combined with her choice to name Ted before Sylvia - seems telling and somehow poignant. We have never seen or even heard of another copy of this book bearing an inscription by Plath. (Provenance - Olwyn Hughes). Bookseller Inventory # 148"
Now, I do not mean to be a jerk but there are some peculiarities in the description such as the comment on this being Plath's "first appearance...in a regularly published book". Plath's poems appeared throughout the mid-to-late 1950s and into the 1960s in the annual Borestone anthologies titled Best Poems of (fill in the year), appearing in 1955, 1957, and 1958 as well as in 1960 and 1963. There is no need to try to drum up interest in a book with such a unique provenance with what is effectively a false statement. Light Blue, Dark Blue was printed once--not regularly-- and that is it. And then even more baffling is the statement about Plath's "adopted surname" and listing her husband's name first. First of all, "Hughes" was her legal, married surname and it is almost legendary that Plath put men first, as it were. From the time she lost the spelling bee to a boy in grade school to her comment on The Hawk in the Rain being accepted before Plath's first collection of poems, "I am so happy his book is accepted first. It will make it so much easier for me when mine is accepted". There are other Plath books with both of their ownership names printed, such as Culpeper's Complete Herbal (1961), The Notebooks of Henry James (1958), and The Notebook of Malte Laurids Brigge (1959) but these are all "Sylvia & Ted Hughes". Several books have "Ted Hughes & Sylvia Plath". For those interested, a reconstructed "Sylvia Plath Library" can be viewed which lists books Plath either owned or for which there is documentary evidence to suggest she read. An email inquiry to the booksellers for an image has not been answered. If it ever is, I will be sure to add it to this post. Catalog description accessed 2 April 1960. The Letters of Sylvia Plath, Volume 1 is set to be published by Faber and Faber in England on 5 October 2017. The Letters of Sylvia Plath, Volume 2 is scheduled to follow in 2018. Volume 1 of the book will be published in the United States by HarperCollins in hardback on 17 October and in an e-book format (Kindle) a week earlier, on 10 October. This is all good news! As a co-editor of this forthcoming two-volume Letters of Sylvia Plath, and as the moderator of the Sylvia Plath Info Blog, Faber and Faber and the Estate of Sylvia Plath have granted me permission to temporarily post online the letters of Sylvia Plath. Please keep in mind that as this is just a preview, most of the preliminary pages are absent. 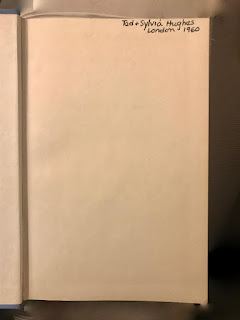 So, if you click this link, you can see the letters of Sylvia Plath, volume 1. All links accessed 31 March and 1 April 2017.